The week ending Friday, April 12, 2019 saw old crop ICE cotton futures gain a cent over Monday-Tuesday, then erode two cents over Wednesday-Thursday, then recover over a cent on Friday. New crop Dec’19 rose and fell in a narrower band around 77 cents. Strong trading volume was associated with regularly scheduled fund rolls. Fundamental influences this week included a neutral-to-bearish WASDE report and strong weekly export sales. The net short hedge fund position during Q1 of 2019 switched to net long in April from a combination of continued short covering and new longs. May’19 and Jul’19 settled at 78.11 (+1.13) and 78.86 (+1.12) cents per pound, respectively. New crop Dec’19 only settled up 60 points at 77.19 cents per pound on Friday. Chinese prices trended higher while world prices declined this week. 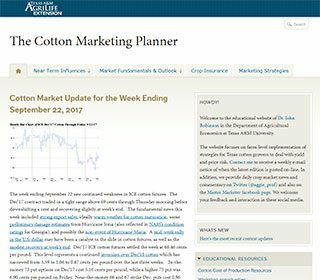 A sample of option premiums on ICE cotton futures saw slight changes associated with the fluctuations in the underlying futures. For example, with Thursday’s futures new crop price weakness, an at-the-money 75 put on Dec’19 cotton settled Thursday, April 11 at 3.16 cents per pound, while an out-of-the-money 68 put traded for 0.86 cents per pound. The large gains in at-the-money put options purchased last fall shows how put options provide a mechanism for down-side price insurance. The last month provides another example of the ever present risk of unexpected market volatility. It can happen in both directions. For example, a concrete resolution to U.S.-China trade relations, or confirmation of lower U.S. planted acreage, or something else totally unexpected could trigger speculative buying. If that happens, I would view such a rally as a selling/hedging opportunity since 1) spec driven rallies tend to be short lived, 2) I would expect a world of contracting and hedging in the upper 70s, and 3) nobody ultimately knows the direction of prices. The most relevant question is always whether a cash contract or a hedge on today’s futures price will be a profitable, or at least survivable, price floor. Given all these uncertainties, growers should always be poised and ready to take advantage of rallies, and protect themselves from sudden sell-offs. Forward contracting of new crop bales, immediate post-harvest contracting of old crop bales, and/or various options strategies can be used to limit downside risk while retaining upside potential. Hedges with puts or put spreads on Mar’19 futures could have been employed as late as November to provide near term protection of old crop bales through the harvest season. Cash contracted 2018 bales could be combined with call options on the deferred futures contracts. New crop put strategies to hedge the 2019 crop are a straightforward and relevant approach — especially if there is a rally in Dec’19 futures. There are a some forward contract offerings with a competitive basis, but with capped (at 31-3-36 quality) premiums and expanded discounts. I have heard more from growers about these contracting opportunities this week as Dec’19 traded above 77 cents. For further analysis and discussion of near term price behavior, click on the menu above entitled “Near Term Influences”. Longer term price behavior is more influenced by fundamental supply and demand forces, which is discussed above under the “Market Fundamentals and Outlook” menu tab.